Blake Griffin’s star power counts as one of 5 reasons the 13-7 start the Pistons have fashioned in the first quarter of the NBA season figures to hold up. DETROIT – The Pistons beat Golden State to hit the quarter pole of the NBA season at 13-7, enough to get them home-court advantage in the playoffs if form holds. There is zero chance they get fat and sassy because, well, they have memories. The Pistons were 14-6 after 20 games last season – with road wins at Boston, Golden State, Oklahoma City, Minnesota and the Los Angeles Clippers – and had nearly an ironclad guarantee of a playoff berth according to projection models. But wait, there’s more – more substantive reasons than stabbing memories to believe these Pistons are built to last … with the obvious caveat that they can’t afford the type of catastrophic injury that cost them Reggie Jackson for three months last season. Reggie Jackson flashing peak form – There are two pretty good reasons to think Jackson is trending upward – three if you factor in the evidence of his past five games, all wins. Jackson’s numbers since his strong finish pushed the Pistons to an overtime win against Houston on Nov. 23: 19.8 points, 5.0 assists, 1.0 turnover on 44.1 percent shooting and 42.4 percent 3-point shooting. Alongside Blake Griffin and Andre Drummond, yeah, those numbers work. The two other reasons the Pistons expect more of that from Jackson: (1) All along, they knew he’d take some time to feel right physically after being held out of anything but individual work and shooting drills until training camp as he rehabbed the torn ankle ligaments suffered last December and (2) he’s adapting to a radically different role – playing off the ball as Dwane Casey funnels the offense through Blake Griffin – after a lifetime of being a ball-dominant, pick-and-roll point guard. Jackson has been a clutch scorer since coming to the Pistons in February 2015. Going into Saturday’s game, he’d scored 45 points in what the NBA terms “clutch” situations this season, good for sixth in the league. Saturday’s game never got uncomfortably close, in large measure because Griffin and Jackson kept making big baskets to blunt Golden State’s momentum. And Griffin is more than willing to share the burden of late-game playmaking with Jackson. That trust he has in Jackson reveals itself in the way they interact in those moments. 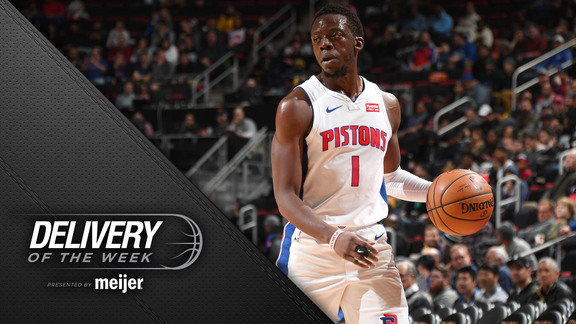 Stanley Johnson turns the bench into a consistent Pistons advantage – One of the biggest hopes internally, based on something more than just wishing, was that the hiring of Casey would spur the development of young Pistons players with Johnson at the head of the list. The move to the bench four weeks ago, so far, has brought out the Stanley Johnson the Pistons always expected existed. Over the past 12 games, Johnson is averaging 11.6 points, 4.2 rebounds, 1.3 steals and less than a turnover a game while shooting 45.5 percent overall and a league-average 35.3 percent from the 3-point line. He’s weaponized his one-man fast breaks. His on-ball defense gives Casey a Swiss Army knife matchup tool, exemplified by his discombobulating of Raptors superstar Kawhi Leonard to spark the huge comeback win at Toronto last month. Casey’s bench unit starts with Johnson and Ish Smith – and Smith’s transition pep meshes ideally with Johnson’s fast-forward instincts – with Langston Galloway and Zaza Pachulia as the other key ingredients. Rookie Bruce Brown’s defense – and especially in tandem with Johnson’s – has recently blended seamlessly, as well. Johnson thrived in a sixth-man role as a rookie on the Pistons 2016 playoff team and he’s his most settled now since then. The chemistry of the unit is palpable. Johnson says it reminds him of that ’16 unit. The imminent return of Luke Kennard, who scored 27 points in a Friday rehab assignment with the Grand Rapids Drive, only increases Casey’s depth and flexibility – though he’ll be cautious with disrupting the bench’s rhythm at this point. And don’t write off Jon Leuer. He, like Jackson, has had to battle the effects of an extended layoff. But the Leuer who averaged 10.2 points and 5.4 rebounds for the Pistons two seasons ago – a versatile player at both ends – can again be a very useful player for this team. Andre Drummond’s everyday consistency – He’s been capable of dominating games since the end of his rookie season, but the inconsistencies of the Pistons in their recent past were often tied to the uncertainty of what they’d get from Drummond from one night to the next. Not this season. It started last season, actually, when he made noticeable strides as a rim protector, and it’s accelerated this season. He’s averaging career highs in both scoring (18.6) and rebounding (16.4) and is on pace to become the first player since Moses Malone 40 years ago to top 15 points and 15 rebounds a game in consecutive seasons. Drummond’s blocked shots rate (1.9) is matching his career best, he’s rarely seen trailing the play any longer in transition and he’s going equally hard the other way. Casey implores Drummond’s teammates to reward him with entry passes if he’s done the hard work to establish low-post position and that’s resulted in reducing the number of shots outside the paint Drummond has taken. His shooting percentage hasn’t suffered even though his shots per 36 minutes (16.4) are up 35 percent over a season ago. It’s hard to imagine the 25-year-old isn’t on track for a third All-Star berth. Blake Griffin’s star power – And by “star power,” we aren’t talking about marketability or box-office pull. We’re talking about a certain type of player – the kind that helps avoid long losing streaks or separates winning from losing in the last few minutes of a one-possession game. Griffin’s size, strength and agility make him one of the NBA’s unique scoring threats – an invaluable trait in those final minutes when it’s well understood that defenders are able to get away with things they couldn’t in the first 45 or 46 minutes. His vision, passing and willingness to let an open teammate take a big shot separate him even further from the field. Dwane Casey’s calming stability – Casey seemed like the obvious choice to fill the opening when Pistons owner Tom Gores decided a change was in order after last season. The Pistons, Gores made clear, weren’t about to embark on a rebuilding project after pushing their chips to the center of the table a few months earlier to add Griffin. Casey’s matched every expectation. And while it isn’t necessarily a surprise that a team has responded well to a coach with a proven track record, this appears more than a “new guy isn’t the old guy” tonic that often prompts a temporary uptick. Casey lasted seven seasons in Toronto – an eternity in today’s NBA – and his players were genuinely anguished to see him go when the decision was made by management. The consistent theme from those who knew Casey best was that his greatest strength was the ability to draw out the best in players – developing their physical skills, yes, but more importantly, perhaps, unlocking the confidence that helped them reach the NBA but got tamped down with each career setback. Sometimes that ability overshadows his pure coaching chops. His end-game maneuvering to help pull out the win in Toronto was Hollywood scripted but also representative. But it remains a critical advantage that bodes well for the continuing evolution of the 2018-19 Pistons. So, yeah, barring the sort of calamity that befell the Pistons last Dec. 26, when Reggie Jackson fell in a heap with the Pistons sitting in the No. 4 playoff slot, there are at least five solid reasons the final three-quarters of the season figure to hold a lot more moments like Saturday’s joyous win before a packed house at Little Caesars Arena.